FRANKFORT, Ind. – Before a much-improved Maconaquah Braves team knew what hit them, the Class 3A defending state champion and No. 1-ranked Northwestern Tigers led 27-0 with nearly two minutes left in the first quarter of the championship game of the Frankfort Girls Basketball Sectional. Playing in its first sectional championship game in 18 years, the Lady Braves witnessed first-hand what so many other teams have been victim too over the course of the last two seasons – when Northwestern is clicking on all cylinders, they are unstoppable. Final score: Northwestern 80, Maconaquah 23. And it could have been much worse. Between the floor vision of Madison Layden, the paint dominance of Kendall Bostic, the sharp shooting of Katie Neher and a stunning full court press on defense, Maconaquah struggled to get the ball past half-court in the first six minutes of the game. By the time the first quarter horn sounded, the Lady Braves had committed 15 turnovers and managed just seven shots on goal. On the other end of the court, Bostic had 12 first quarter points on 6-of-7 shooting while Neher added eight, Layden seven and Sarah Heaver six for a 31-2 lead after eight minutes. Despite the lack of a full court press from Northwestern, the second quarter went much like the first as the Tigers built a 40-3 lead before heading into the halftime locker room up 50-8. From there, head coach Kathie Layden had her team work on staying sharp while getting playing time for the entire roster. 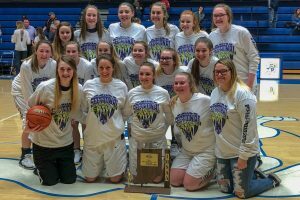 Leading 71-11 after three quarters, Northwestern cruised through the final eight minutes and hoisted its third consecutive Class 3A Sectional 20 championship trophy. Bostic finished with 26 points and nine rebounds, Neher had 17 points, Layden dropped in 13 points and Heaver added 10. Maconaquah (11-13) was led by the 14 points from freshman Lilly Maple. The Lady Braves made huge strides after posting just three wins in the last two years, including a 1-21 campaign last season. In fact, a 53-43 win over Frankfort in the quarterfinals was its first sectional victory since downing Jay County in 2002. Northwestern (23-3) advanced to the championship game after topping Hoosier Conference rival West Lafayette 70-33. Layden led the Lady Tigers with 29 points while Bostic had 22. Next up for Northwestern is its third straight date in the Sweet Sixteen. The Lady Tigers will face Gary West Side (20-7) at approximately 1 p.m. in the second game of the Rensselaer Central Regional. Game one at 11 a.m. features No. 5 Mishawaka Marian (21-3) and Knox (21-4). The championship is slated for 8 p.m. Kokomo time. Also at the Frankfort Sectional, Western (11-12) lost a semifinal game to Maconaquah 58-54. Clara Braswell scored 14 points to lead the Lady Panthers. Class 4A Sectional 7 at Zionsville: The Kokomo Lady Wildkats season came to an end with a 67-28 loss to No. 16 Zionsville. The Lady Kats trailed 22-0 before scoring its first points late in the first quarter. Senior Adria Hartley led Kokomo with 17 points while freshman Chloe McClain added 10. The loss was the sixth-consecutive opening game loss for the Lady Kats in sectional play. Kokomo finished the season 3-20 after a 6-17 campaign last year. The 20 losses are a first for a Lady Kats squad and the three wins are the fewest since the very first team finished 2-4 in 1974-1975. Kokomo’s last girls basketball sectional title came in 2008. Class 2A Sectional 39 at Madison-Grant: The Taylor Titans made No. 9 Tipton sweat for the first 30 minutes of the 32-minute sectional semifinal. After a rocky start, Lady Titan senior Taylor Boruff hit a buzzer-beating 3-pointer to tie the game at 11 after the first quarter. That ignited a Titans rally that saw the squad lead 34-19 at halftime. The lead got as high as 17 (38-21) midway through the third period before the Lady Blue Devils, led by Cassidy Crawford, began showing why they are highly ranked. An 18-8 run cut the lead to 46-39 after three stanzas and a 19-4 run in the fourth put the game away, but not until the final 120-seconds of action. Boruff finished with a double-double of 18 points and 11 rebounds and concluded her high school career with 1,023 career points. Kelsi Langley added 14 for Taylor. The Lady Titans finished 13-8 for its first winning season since 2010-11 and first for third-year head coach Tony Oliver. Earlier in the tourney, the Lady Titans defeated Alexandria 70-52. Boruff, who transferred from Northwestern this season and is a High Point University recruit, had 29 points to lead the way while Langley had 21 and Emma Good added 16. Eastern dropped a 36-34 contest to Eastbrook in the quarterfinals. McKenzie Cooper had 11 points and 14 rebounds for the Comets while Lexi James and Jeannie Crabtree each had 10. This entry was posted in IHSAA, Northwestern. Bookmark the permalink.